To play the thumb piano (kalimba), the musician pushes down on a key with a thumb. When the key is released, the vibration resonates in the wooden body. 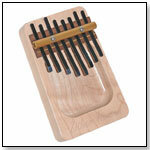 A thumb piano is sturdy and easy to carry, making it an choice for children. The 8-note dished thumb piano forms a pentatonic scale (sharps and flats only). Made in the U.S.A. from sustainable native North American solid cherry, maple, or black walnut.